In autumn 2017 we reported on the award of the Benjamin Franklin Medal to Susan Trumbore, Managing Director of the Max Planck Institute for Biogeochemistry. 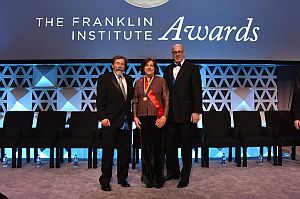 In April 2018 the award ceremony took place at the Franklin Institute in Philadelphia, USA. For the awardee, this also meant a busy week with a symposium on the global carbon cycle at the University of Delaware, seminars, interviews and filming. The highlight was the festive celebration with the presentation of the medal for her merits in Earth system research. Susan Trumbore received this special award for her groundbreaking use of radiocarbon measurements in forests and soils to assess the carbon flux between the biosphere and the atmosphere. Her research thus makes an important contribution to understanding climate change.